We've all seen a YouTuber drop those custom Amazon links while reviewing or just talking about products in their video. I think one of the sayings the new digital age generation will leave behind for the future will be ... "Link in the description down below". In this article I will breakdown how to join Amazon's associate program, what the basic requirements are needed to stay an associate, provide some ideas to get your website, YouTube channel, blog, vlog, etc., while earning you some passive income! ... "Earn advertising fees from Qualifying Purchases, not just the products you advertised." .... "Whether you are a large network, content site or blogger, we have simple linking tools to meet your advertising needs and help you monetize your web site." In a nutshell - Amazon can use your blog/YouTube video/online store for the advertisement of Amazon products. You, of course, can earn commissions based on product sales. This is done through customizable links to virtually any product or service on Amazon. ... Before signing up it is important to have a at least a small following on whatever platform you will use to link products. This could be your YouTube channel, blog, online shop, social media - anything that could have a following that meets Amazon's guidelines. Those guidelines can be found here. Step 1. Go to Amazon's website as if you were looking to purchase something. ... Or you can just easily click here. Step 2. Fairly straight forward - just click on the 'Join Now For Free' option. ... You will need a proper website to use in the application. This means that you need to own your website. I don't think free websites are eligible. If you are an influencer - things are pretty much the same but the variations can be found here under the Amazon Influencer Program Policy (“Influencer Program Policy”). *If you are using Instagram, Facebook, or another social media platform as an influencer make sure to have 500+ subscribers/followers. Step 3. Setting up your account is next. For this you need to fill out a W9 form for tax purposes and provide banking information so you can get paid. Bank Information - You will need your banking account number and routing number. This information can be easily located on a personal check. ... At this point Amazon should have sent you an email welcoming you to the program and laying out the requirements for being accepted as an Amazon associate. The main requirement you need to focus on is getting 3 sales in 180 days, which is a pretty reasonable deadline in my opinion. After the first initial 180 days, Amazon will review your account and you will have a definitive answer as to whether you are fully accepted or not, into the program. So, this is true to an extent. Amazon only pays 10% commission for Amazon Fashion Women, Men & Kids Private Label, Luxury Beauty, or Amazon Coin. 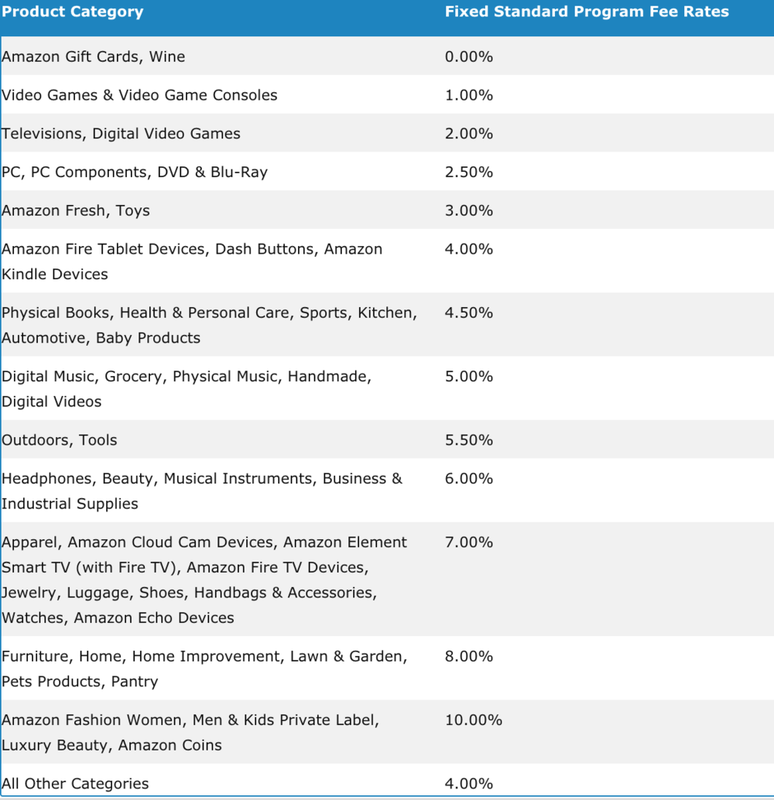 This information comes directly from Amazon's Fixed Standard Program Fee Rates for Specific Product Categories. A link to the full details and the breakdown of product commissions can be found here. ... While it's not ten percent, if you are selling enough it's more than enough to generate a good amount of side, passive, income. Have you ever seen a YouTube video or read an article online that ended up feeling like a really well dressed up ad? This is the line that we start to walk when content starts being monetized. I wouldn't advise finding expensive or 'hot' items on Amazon and make a video or blog post around the item. Use the links in a more natural way that your audience will be much more engaged with. If you are looking for great examples of natural product linking, check out Peter McKinnon's YouTube channel here. You've probably heard this before. I'll tell you again - find your niche market and focus on that. Sometimes it can be hard to find a niche or your target audience. In my opinion I think you'd have more luck if you have 900 subscribers that really dig you and your content than 5,000 'follow for followers' that wouldn't watch your video let alone click your Amazon link. I've been using the term passive income quite a lot in this article so I want to define what it is and why it's a good thing to look into in. In basic business 101 class you'll learn about two different types of income - passive and active income. Active income is typically defined as any revenue you have to go out and earn. An easy example would be any job that you work that results in paycheck. Passive income is just the opposite. It implies working to set up a self sustaining system that you can walk away from and still yield earnings. An easy example of that would be a YouTube video or blog post that you actively create - but once the content is live you can move to the next project but the content can still earn money by itself. I hope this has helped you understand more about Amazon associates and/or given you the tools to sign up. If you are looking for some more references and information on affiliate marketing here are a few resources down below. These are well priced and filled with information you can use instantly. Sign up to be kept up to date with my latest content.